Intek Instruments offers a wide range of Proximity Sensor of BAUMER, FOTEK Taiwan, P&F Germany, and OMRON India. Some of our Service area includes, Delhi, Haryana, Punjab, Uttarakhand, Uttar Pradesh, Kerala, Rajasthan, Jammu and Kashmir, Maharashtra, Gujarat, Andhra Pradesh, Madhya Pradesh, Tamil Nadu, West Bengal, Telangana, Kerala, Arunachal Pradesh, Odisha, Karnataka, Bihar, Bangalore, Chattisgarh, Jharkhand, India, Nepal. Keeping track with market development, we are engaged in offering our clients with an excellent quality range of Proximity Sensor. Precisely manufactured with the use of quality approved components and cutting-edge technology, this proximity sensor is made available in enormous technical specifications for our patrons to choose from. 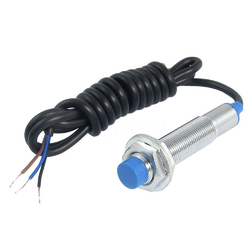 Our offered proximity sensor is well-examined on several quality parameters and is provided at pocket-friendly prices to our renowned clients.